Not every Snapshot release needs to add a bunch of new features. Sometimes, the best updates are focused on what’s under the hood and optimize existing features or contribute to the overall quality of life of the game. Minecraft Java Snapshot 19w06a is a small update, but it includes a few details that are worth noting along with an update to LWJGL and a number of bug fixes. It may not stick around for the final release, but the new splash screen with loading bar is a nice touch. We saw this pop up about a week ago from @Dinnerbone as a test, but this update is actually more helpful than you may realize. No longer do we have to deal with the client being frozen and unable to be resized or moved. No more waiting on the game to load before you can close it out (for all those times you habitually launch the game when you meant to click something else). Now, thanks to this new splash screen, you can move, resize, and close the window immediately, all while seeing a nice progress bar that tells you how much longer you have to wait before getting your next game started. 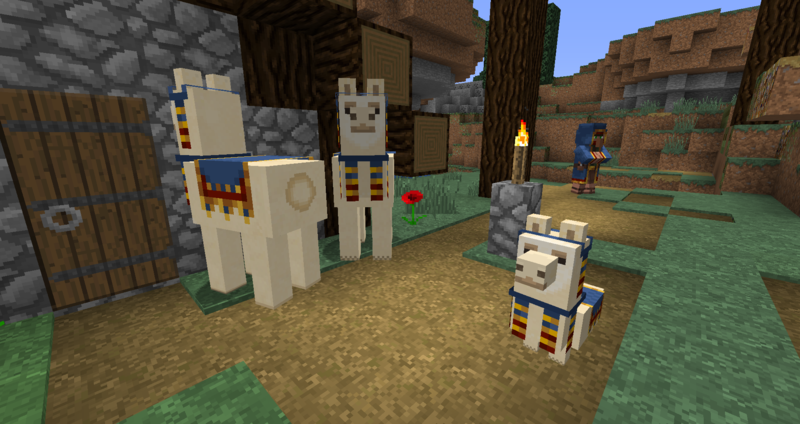 If you didn’t check out Snapshot 19w05a, you may not know that the Wandering Trader and Trader Llama were two new mobs added to the game last week (sorry we didn’t cover that update). On the bright side, they basically had no function and didn’t even move unless being chased down and attacked. This week, though, the Wandering Trader gets a little AI added. 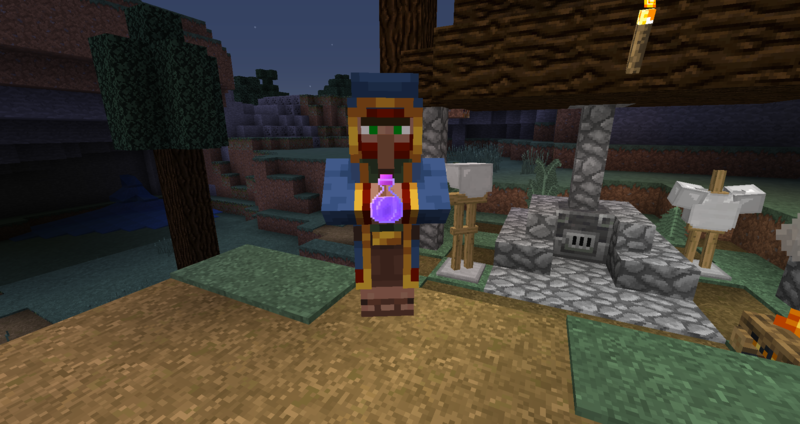 When it becomes night, the Wandering Trader does something pretty unique compared to other mobs and Villagers – it drinks a potion of invisibility! If you’re out looking for a Trader, you’ll need to keep your eyes peeled during the day, as the particles from being invisible really are difficult to see. Makes us wonder if a potion for seeing invisible entities might be coming in the future. On the other side, when dawn arrives the Wandering Trader pulls out a bucket of milk and gulps it down so you can see it once again. It’ll be a funny thing to see when you’re just wandering around and suddenly a bucket of milk appears floating in the air. Have you ever wanted to have a Redstone Lamp that was lit at all times, but with no Redstone pulse going to it? The new BlockStateTag allows for that to happen, along with some other neat use-cases. By typing in a command like what you see in the screenshot above, you can now give a player an item that stores a value which is not reverted when the block is placed. You could, for example, place down a lit Redstone Lamp, a lit Furnace with no fuel or items in it, an End Rod that only places facing in a certain direction, or even a Chest that is already waterlogged. The Minecraft Wiki has a full list of all current working block states that you can mess around with. The data from the BlockStateTag is stored as an NBT tag on the item, and when you break an already placed item it does not drop with the same block state data attached. Breaking that chest there will result in a water source block and a normal chest drop. The particles.png file has been split up this week, marking a nice move that will be good for texture pack creators. With particles.png, particle designs were all stored in one single file, and changing them really wasn’t easily possible. By splitting the particle textures into their own files, texture artists can change the individual textures for each particle and even create custom animations for each of them. This breaks existing texture packs, but the Mojang team is working on some backwards compatibility. What does all of this mean for Server Owners? This week’s Snapshot really seems to be targeting map makers with the particle textures and BlockStateTag. Server Owners may find some use out of these, especially if you’re trying to create unique experiences for your players with custom textures, dungeon instances, and the like, but for the most part they won’t get too much use out of this Snapshot. The Wandering Trader changes are interesting, and definitely make the new mob feel unique. It also opens up the door for other mobs to have similar environmental responses in the future, which could be cool. Imagine Pandas climbing up on Bamboo trees when hungry, or Wolves looking for an open cave to sleep in at night. Those sorts of things could really give life to the world, which our players might really enjoy experiencing. As the game gets better, our servers do, too. Hey those blocks kemping block States are actually really cool 👀! It’s also good to see you picking this up.